Egypt's Minister of Investment and International Cooperation Sahar Nasr revealed on Wednesday that Uber International is set to introduce public bus services in the country pending the issuance of a law regulating its activities in Egypt. Nasr said in an interview on ONTV channel that the new service will include all Egyptian governorates, and will not be limited to Cairo and Giza. The minister added that the company will announce within three month that it is injecting large investments in the country. Uber has not announced the price of its awaited service, which Nasr said is set to be introduced in the upcoming three months. A ticket for high quality buses currently operating in Egypt costs EGP 6, while tickets for regular buses range between EGP 1.5 and EGP 2.5. 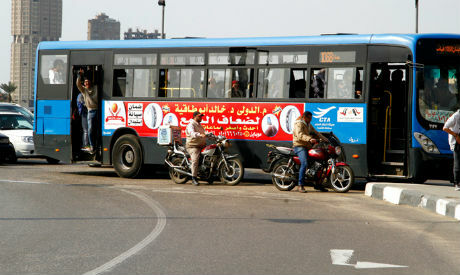 Tickets for air conditioned buses cost EGP 3. Egypt's President Abdel-Fattah El-Sisi met on Wednesday with Justin Kintz, the director of public policy planning and strategy, America at Uber, on the sidelines of the 72nd UN General Assembly meetings, where they discussed opportunities to expand the company's investments in Egypt during the upcoming period. The San Francisco-based cab-hailing company is currently operating in Cairo, Alexandria and Mansoura, in addition to providing services in the North Coast resort area during the summer season. In July, Uber's competitor in Egypt and the Middle East, the Dubai Based Careem, bought a minority stake in a five-month-old local Egyptian start-up Swvl, which connects commuters with private buses in Cairo. Last March, Egypt's cabinet said that it would regulate Uber and Careem by drafting new legislation after hearing recommendations from a ministerial committee. No legislation to regulate the mobile apps has passed yet. The announcement by the cabinet came following months of protests by drivers of traditional taxis over the perceived threat to their livelihood posed by companies like Uber. In 2016, Uber said that 30,000 drivers are using the service in Cairo as a source of income, making the Egyptian capital the fastest growing market in the region for the car-hailing application since its launch in late 2014. In 2014, figures released by the Central Agency for Public Mobilisation and Statistics (CAPMAS) said that public transportation users in Egypt stand at 5.2 million passengers a day in a country with a population of 89 million. Last July, the head of Egypt's General Transport Authority Rizk Ali told Ahram Online that dozens of new "high-quality" buses similar to those seen on the streets of Europe have been put into service in Cairo in a bid to offer a possible alternative for private car owners to help ease congestion in the traffic-choked capital. The step is part of a plan to provide hundreds of these buses in the next few years running across four lines serving areas including Shubra, Cairo International Airport, downtown's Ramses, Heliopolis and Obour City. The General Transport Authority will merely oversee operation of the vehicles, which are owned by the Egyptian Advanced Company for Public Transportation; 70 percent of which is owned by the Emirates National Group. Egypt’s public buses are notorious for being poorly maintained and overcrowded, and are rarely used by well-off Egyptians. This has resulted in an increasing number of private cars on the streets, which causes congestion throughout the day in a capital of some 22.8 million people.